An Armenian wedding procession makes its way to the church. First are the musicians. They are followed by the bridegroom, accompanied by a young man with a sabre. Then come the groom’s father, priest, and women of the party, including the bride dressed in red. Candle bearers walk before the bride and the groom; the couple will keep the candles after the marriage. 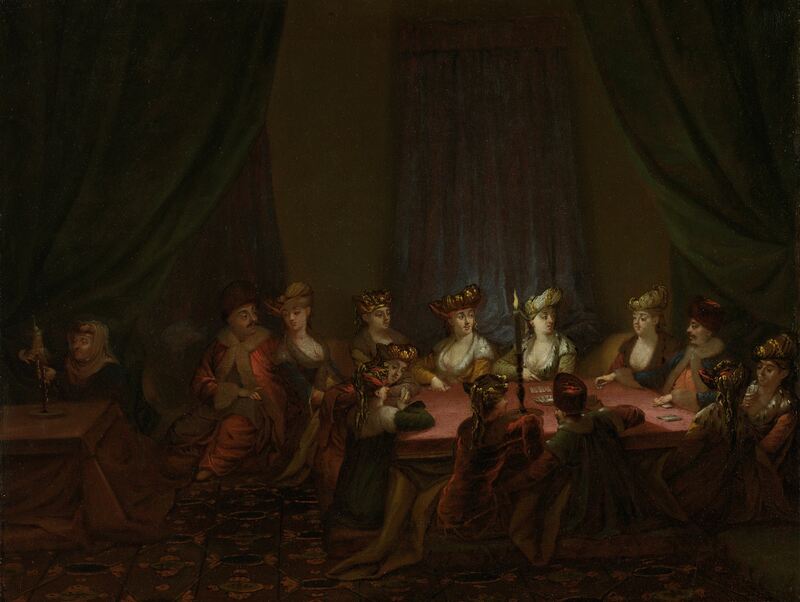 Men and women while away the evening playing cards. The atmosphere is informal: the man in the foreground shows keen interest in his dining partner. As in Vanmour other ‘Turkish’ paintings, he accurately documented the details of the clothing, such as the fur-trimmed coats typically worn by Armenian men. 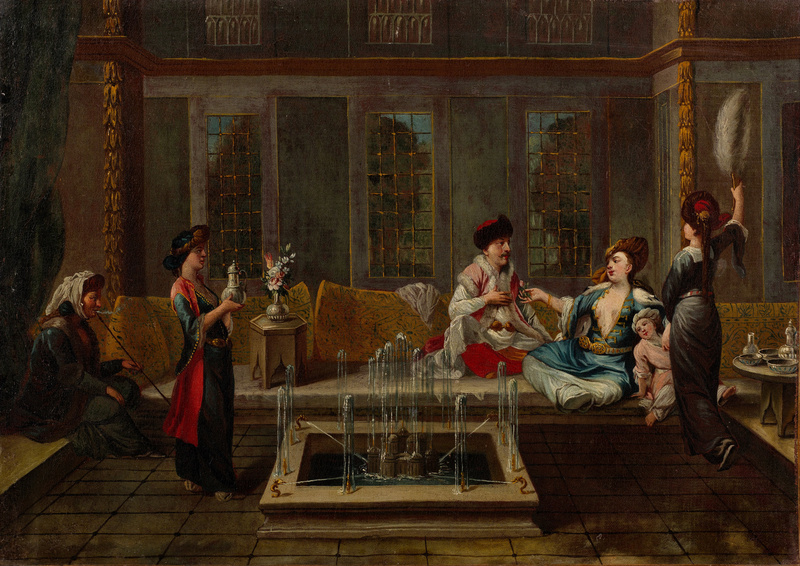 Here Vanmour displays an Armenian interior of women drinking coffee with an Armenian gentlemen. According to some source this painting is labeled “Armenian women drinking coffee in an interior”. 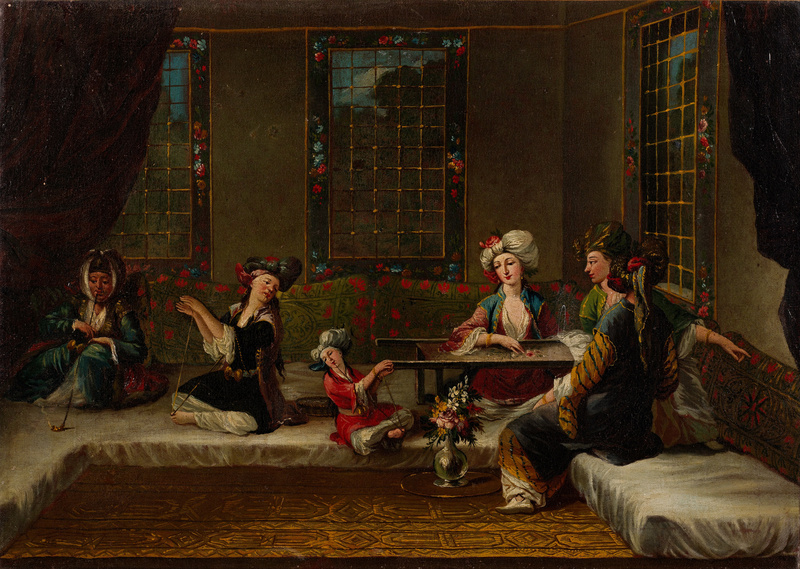 Women embroidering in an interior. This painting is located in a museum in Istanbul (Turkey), there it is labeled simply as “Women embroidering”, however some sources describe it as “Armenian women embroidering”. Jean Baptiste Vanmour had created several other paintings of Armenians from the Ottoman era, including an Armenian architect, a noblemen with his son etc… but I couldn’t find any high quality images of these paintings so I’m not going to share them here right now. Perhaps in the future when I’ve located better quality images of these painting I’ll make sure to share them with you! P.S. click the images to see the full size. These are wonderful– thank you so much for sharing. Do we have an idea of what part of the Ottoman Empire Vanmour travelled– i.e., any idea what the locale for these paintings are? One might think Constantinople? Yes it is Constantinople/Istanbul. Although I am not sure to what other locations he traveled since he also has some paintings on Armenians from Persia, but these paintings here refer to his stay in Constantinople. Thank you, you’re correct the original name is spelled Van Mour. However he is more commonly known by the Vanmour spelling and that is how he’s spelled in the Dutch Imperial Museum. Perhaps it’s a French version of Van Mour, since we know he moved to France early in his life. His name also seems to be Francisized. Perhaps his original name was Johan Doper Van Mour? everything French was regarded “smarter” and more prestigious than the Dutch. I know this just by our own literature. Armenian girls were taught French and a class above would learn piano for their future higher rank of match .